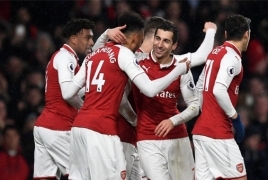 PanARMENIAN.Net - English former professional footballer Ian Wright has given his honest opinion on Arsenal midfield duo Henrikh Mkhitaryan and Mesut Ozil by saying the Gunners can't afford to keeping paying them £500,000-per-week combined and get very little in return. Ozil, 30, has scored three goals in 10 Premier League games thus far but only recorded one assist, which simply isn't good enough for a No.10. Arsenal boss Unai Emery has revealed that Ozil could also miss Wednesday, December 5's trip to Manchester United after he trained on his own on Monday. "As good as Mkhitaryan and Ozil are, in respect to what they're earning we're talking about £500,000-per-week," said Wright on BBC 5 Live Sport. "You're going to lose [Aaron] Ramsey as well who probably wants £200,000, so we're going up to £700,000-a-week in money that we're going to have to give. "Surely you’ve got to find three or four players that you can pay a lot of money to that will give you the output you want." Wright has always been a big fan of Ozil, but even the former striker is now having his doubts about whether the 30-year-old represents value for money. As for Mkhitaryan, the Armenian has at least been a better signing than Alexis Sanchez.